Things were beginning to take a positive turn for the Fighting Illini football team. New head coach Lovie Smith had assembled his coaching staff, finally started spring practice, and the team was beginning to show signs of respectability since they were getting some of their key players back from injuries a year ago. Well, almost. Almost a year to the day that he first tore his ACL in a non-contact drill, Mikey Dudek suffered the exact same injury to the exact same knee in the same type of drill, non-contact. This young man, who is ultra-talented, cannot seem to catch a break, and will once again watch another football season from the sidelines as he once again recovers from surgery. The list of injuries to Fighting Illini athletes has grown to a number that is almost laughable, and between football last season (Dudek, Dre Brown, Teko Powell, Reggie Corbin), men's basektball (Tracy Abrams, Leron Black, Mike Thorne Jr.) and women's basketball (Cierra Rice), one would have to wonder what is going on at Illinois, and what have they done to the athletic gods? 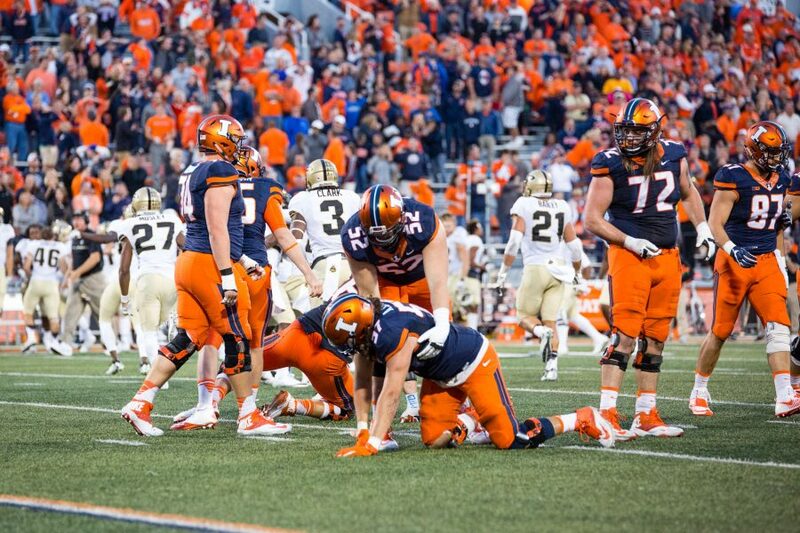 Dudek's latest injury comes at a time when the Illinois football program was undergoing an idenity transformation under Smith, and with a roster that is thin to begin with, the loss of Dudek clouds an already uncertain 2016 season. After all, this is considered to be a rebuilding project for Smith, and this further complicates things, at least for the short term. As far as spring practices go, the first one, held a week ago last Friday, was very scripted and didn't look like it was the first one. Lovie has the Illini looking somewhat sharp, and the cast of characters that he has brought in as assistants give him instant credibility. Garrick McGee, who was previously at Louisville, was brought in to run the offense and Hardy Nickerson, who was an all-ro linebacker in his days in the NFL, is the defensive coordinator. The Illini will continue to practice this coming week, and the public's first and only chance to see the Fighting Illini in action will come n Saturday, April 16th with an open practice. Smith decided against a spring game due to the late start of spring practice, so an open workout will take the place of it. The practice will begin at 1:00 pm, and will be free to the public. Both the Illinois baseball and softball teams have entered Big Ten play, and the results have been mixed for both squads. The Illinois baseball team is finding life after Tyler Jay and the other players that propelled them to the NCAA Super Regionals last spring rather difficult. The Illini just completed a series at Iowa against the Hawkeyes, and lost two out of three games to fall to 13-16 overall and 4-5 in conference play. The Illini will return home this Tuesday evening to face the Illinois State Redbirds (6:00 pm CT first pitch). The Illini defeated the Redbirds 8-3 earlier in the season in Normal, and after the game on Tuesday, will welcome the St. Louis Billikens to Illinois Field for a rare three game series not conference related. The Fighting Illini softball team has enjoyed some success this season under new coach Tyra Perry, and are currently 23-15 overall, but just 3-6 in Big Ten play. Illinois dropped a three game series to Minnesota this past weekend in Minneapolis, and will return home on Wednesday night to face Northwestern in a mid-week conference doubleheader. After the games against the Wildcats, the Illini will make the short trip east to battle the Purdue Boilermakers this coming weekend in West Lafayette.